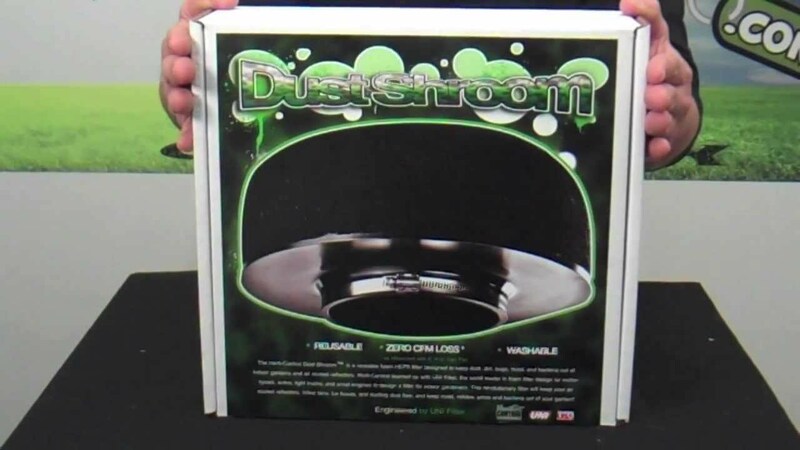 QUESTION: I’m setting up my latest marijuana grow room and am interested in a Dust Shroom air filter. I’m wondering if they’re light proof? Also do you have any tips on maintenance, how often should I wash it and how do I go about re-oiling it? So to answer the question, I think something like this you’d probably have to clean like once or twice a month and probably oil it every 45 to 60 days—you’ve got to maintain it. Also bear in mind that they’re trying to sell you something. And that something is about $80. If you really want to spend the coin we’d love to know how it works out for you. Holla at Discount Hydroponics and they can assist you further. It looks like they have the cleaning kit (that comes with a bottle of biodegradable cleaner and an aerosol can of biodegradable plant-based rosemary and cedar oil.) The directions say when your Dust Shroom is dirty, just spray the cleaner on, rinse it with warm water, allow it to dry and re-coat it with the biodegradable oil. Therefore you’re good with that right there. Keep those questions coming! All of our love from The Kitchen! To answer all your cultivation questions we’ve teamed-up with experts Jay Kitchen and Uncle Tweezy, authors of The Kitchen presented by Uptowngrowlab —an oversized, hard-covered, coffee table book that’s 50% grow guide, 50% adventure story and 100% awesome.